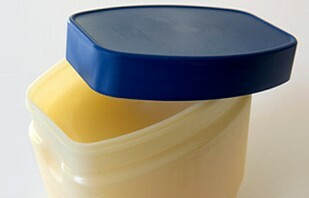 Petroleum jelly is a fat mixture of hydrocarbons manufactured from petroleum products. Many consider it a staple for medical treatments. It is used as a topical treatment that can help protect damaged skin and smooth skin that is try or cracked. The emollients in the gel fill up gaps between your skin cells, helping to hydrate it more effectively. This can be useful for a number of conditions all over the body. Any portion of the body that is itchy, dry or chapped loses their ability to protect themselves from additional damage. This increases your chance that your skin will become further cracked or infected. Placing petroleum jelly over these spots provides a layer of protection that will not irritate damaged skin because it has no fragrance, color or additional ingredients that can irritate allergies. Parents will frequently use petroleum jelly to prevent diaper rash on babies. It can also be used to prevent skin from becoming chapped when you will be exposed to tough elements. Hands contain a number of natural oils to keep your skin smooth, but these can easily be washed away throughout the day. Conditions like eczema can also cause the skin on the hands to become dry and cracked. Putting petroleum jelly on the hands can help seal in the natural oils so they will not become damaged throughout the day. Petroleum jelly is easier to keep in place so it can properly soak in because it is more water resistant to water. Cracked feet are typically treated by applying petroleum jelly. Jelly should be applied to the affected area at night. Cover the jelly with a pair of clean socks and go to bed to prevent the jelly from wearing onto the sheets. Many find that by morning calluses, cracks and dry spots have been eliminated. This can also make your feet more resistant to hot spots or blisters. Throughout the aging process, the skin becomes thinner and drier. Products have been invented to help prevent this, but they can contain ingredients that will irritate the skin. Instead, applying petroleum jelly can help reduce wrinkles, flakiness and dryness that can make skin look older. Doctors will frequently place petroleum jelly over scrapes or cuts to add a layer of protection. This can also cut down on your risk of developing a scar and increases the healing process by keeping the skin’s natural moisture in place. In some cases, petroleum jelly can also be used to reduce inflammation by cutting down on your risk of infection. Wounds with petroleum jelly should have a bandage applied to prevent the jelly from wearing off. Petroleum jelly makes an excellent lip balm, soothing chapped lips. It can also be used as a moisturizer or help you remove stubborn makeup so it will not dry the face. Food coloring can be added to petroleum jelly to make eye shadow. The same technique can also be applied to create lipstick or blush. Perfume that tends to fade quickly can be protected by a layer of petroleum jelly. Dap perfume on key pulse points, then cover the area with petroleum jelly and you will find that the scent lasts all night. Lining the skin around the nails with petroleum jelly before your manicure can protect your cuticles. If polish strays from the nail, it will be easier to wipe away from the petroleum jelly without harming your skin. Eyebrows that refuse to lie flat and tend to curl on the face can be convinced to stay in place when you apply a bit of petroleum jelly.